Hi, folks. Just got here today (as in just discovered the site). Hey, I was wondering if anyone here has tried putting a 150/80 or 160/70 rear tire on the front of their Valk. It's time for me to do something as my front ME880 150/80 is done. Any thoughts? Welcome to our site...Not sure, I ride a 1300 VTX! It'll work for me if it would fit! Yeah, it looks like a 160 will fit fine. A 170 would be a very tight squeeze. But, on the other hand, I did manage to get a 205 Triple tread under the back ok. I'm just a little chicken to be the first. Welcome to the site. Some Valk and Wing riders are putting rear tires on the front. Just make sure you run the rotation arrows backwards. This keeps the belts from sepperating under heavy breaking. There is a great thread about it on here some where. Some one should remember where. My memory never was that good. Thanks Jerry, I'll look around. Mine has a Shinko 150/70/17. I love it. Wish I had done this before. What is the advantage of a rear tire on front? Alpha Dragon wrote: What is the advantage of a rear tire on front? Deeper tread depth = longer life. Avon 130/90/17 ....Seems to be the best bet for keeping close to same height. After all those arguments were debated to death and settled, some still recommend running the tire backwards. No thanx. ValkRy98 wrote: Hi, folks. Just got here today (as in just discovered the site). Hey, I was wondering if anyone here has tried putting a 150/80 or 160/70 rear tire on the front of their Valk. It's time for me to do something as my front ME880 150/80 is done. Any thoughts? I am running a Bridgestone Trail Wind 150/70/17 VR on the front of my 1997 Valkyrie. I love this tire. I know, it's a dual sport that is used on a BMW rear dual sport bike. At first I regretted buying the tire until I found out that my Inflator/tire gage was off by more than 6 lbs. as soon as I checked the air with three other gages and added 7 lbs of air, I was very impressed with this tire. I know of others that have 25,000 miles on one and I had to try it out. With low air it wants to dive into a turn, the same has been said about it once you have 25,000 or so miles. It seems to "roll" as opposed to carve like my old Dunlop. I have 400 miles on it and drag the pegs till sparks fly on ramps and it holds any other front tire "IN MY OPINION" though I am not a tire expert. I AM NOT RECOMMENDING THIS TIRE OR ANY OTHER TIRE TO ANYONE. Do not under inflate this or any other front tire(ever had a flat). I am running a tad over 39 lbs. according to one of my gages and am going to add a lb. or two to see how it works. I've have wondered about using dual sport tires on the front. Question, Is that tread pattern noisy? But I have been happy with the Avon Cobra's on the front.. I like how my bikes hold the road..
Not many will ever try a rear on the front and I respect the fact some stay with their conviction on MC tires. I just know that all tire mfg's could give us a tire that lasts at least 19,'000 miles. THE problem is that the same people who design MC/cruiser tires work for the people that $ell them. I am the one who rides my bike and I don't ever let anyone work on my bike unless I have to. Even then I check their work. I would never ride my bike if my conviction was that it was anything but safe. To each his own. 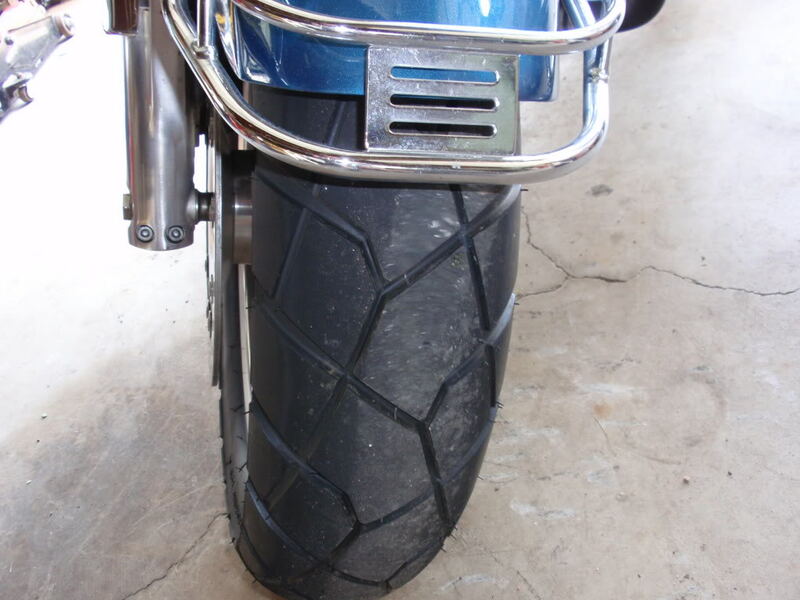 i am new to the forum and i really would like to learn more about running a rear tire on the front and understanding the argument to run the rotation backwards as well. i just bought a performance car tire for the rear of my valkyrie interstate so i am embracing the Darkside and want to know what else is out there for me. have you reversed the rotation of the tire? do you subscribe to this theory? thanks for the info! Breeze... What tire are you using again?? Hmmmm I can't find it at my dealers..
Also is it a radial or a bias ?? Is that what folks call a Battle Axe?